At last the American right and left have one issue they unequivocally agree on: You don’t actually have to read Sarah Palin’s book to have an opinion about it. Last Sunday Liz Cheney praised “Going Rogue” as “well-written” on Fox News even though, by her own account, she had sampled only “parts” of it. On Tuesday, Ana Marie Cox, a correspondent for Air America, belittled the book in The Washington Post while confessing that she couldn’t claim to have “completely” read it. “Going Rogue” will hardly be the first best seller embraced by millions for talismanic rather than literary ends. And I am not recommending that others follow my example and slog through its 400-plus pages, especially since its supposed revelations have been picked through 24/7 for a week. But sometimes I wonder if anyone has read all of what Palin would call the “dang” thing. Some of the book’s most illuminating tics have been mentioned barely — if at all — by either its fans or foes. Palin is far and away the most important brand in American politics after Barack Obama, and attention must be paid. Those who wishfully think her 15 minutes are up are deluding themselves. The book’s biggest surprise is Palin’s wide-eyed infatuation with show-business celebrities. You get nearly as much face time with Tina Fey and the cast of “Saturday Night Live” in “Going Rogue” as you do with John McCain. We learn how happy Palin was to receive calls from Bono and Warren Beatty “to share ideas and insights.” We wade through star-struck lists of campaign cameos by Robert Duvall, Jon Voight (who “blew us away”), Naomi Judd, Gary Sinise and Kelsey Grammer, among many others. Then there are the acknowledgments at the book’s end, where Palin reveals that her intimacy with media stars is such that she can air-kiss them on a first-name basis, from Greta to Laura to Rush. Sarah Palin: Heading into Obscurity Anytime Soon? We can only hope. The most exciting event of our time is coming and I can hardly wait. The day everyone has been waiting for will be here on Nov. 17. 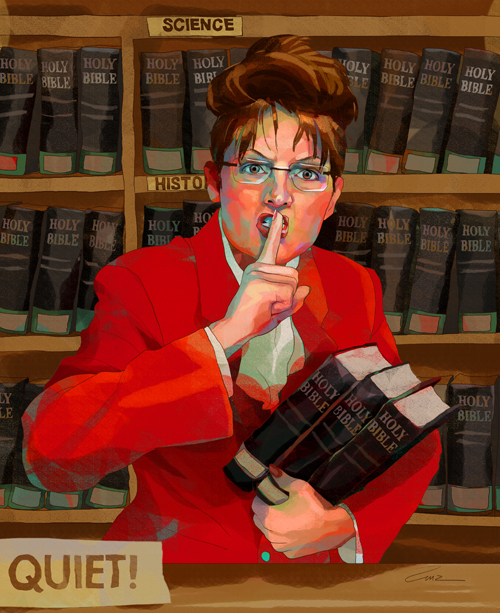 Going Rogue, Sarah Palin’s great American novel will finally arrive! Bring out the champagne. Let’s all have a book party. This is THE event of the century. Even before the first copy is released, Going Rogue is outselling other women of equal intellect and accomplishments. A Woman in Charge: The Life of Hillary Rodham Clinton is down in the numbers . Palin is way ahead of The Majesty of the Law: Reflections of a Supreme Court Justice, by Sandra Dey O’Connor. Not even that amazingly accomplished Paris Hilton: Life on the Edge, can match Palin’s literary success. Here she is, folks. The Lady of the Year, the Maverick to end all Maverick’s, the new leader of the Republican Party in skirts. What a woman! What an amazing role model for all ambitious young women everywhere . Especially those who want to rise to fame and fortune based on their charm and their wit, and their ability to manipulate the conservative right like nothing ever before. Newly released "Sarah Palin's Secret Diary" forged by Joey Green. The author, Joey Green, is a former contributing editor to the National Lampoon, and the author of many books, including Selling Out, The Zen of Oz, Monica Speaks, You Know You’ve Reached Middle Age If…, The Jolly President (or Letters George Bush Never Read), and Famous Failures. Green has appeared on Good Morning America, The View, and The Tonight Show with Jay Leno, and has been profiled in the New York Times and People. GOP candidates Senator John McCain and Governor Sarah Palin on the 2008 presidential campaign trail. John McCain’s duplicitous defense of his 2008 GOP running mate Sarah Palin this past weekend is as dishonest as it is shameful. He knows better–but for reasons that are rooted deeply in McCain’s peculiar sense of chivalry and his political self-interest, he has refused to come clean about Palin with the American people. The implication is that the Republicans would have won were it not for the economic collapse that took place on September 15. Many McCain and Palin operatives in the aftermath of the election have blamed the economy for their loss. That’s like blaming a lake in the middle of the 18th fairway for costing one a golf match. The lake doesn’t cost you the match–driving your ball into it does. Seeing Double: Award winning actress, writer, comedienne, and producer Tina Fey with Alaska's former governor Sarah Palin on Saturday Night Live episode televised October 18, 2008. While months ago comedian Tina Fey vowed to deep six her celebrated Sarah Palin impersonation, now she says it’s likely bound for a resurrection. 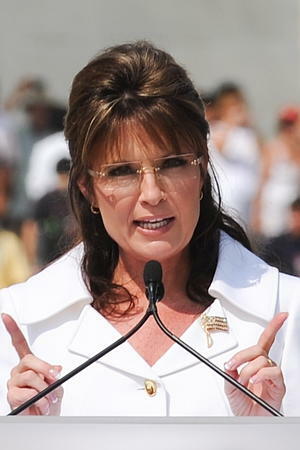 The Palin wig will soon have to “come out of the closet,” she vowed to Harper’s Bazaar.